Every year, both humans and animals undergo various types of orthopedic procedures to repair traumatic, overuse, and developmental problems associated with the bones, joints and associated soft tissue structures (ligaments, tendons, and cartilage). 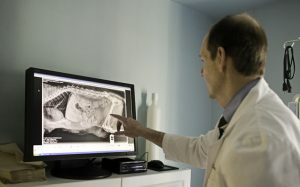 Fortunately for our furry friends, orthopedic surgery is a growing and expanding area in the field of veterinary medicine which not only includes surgical repair of the musculoskeletal system, but also is expanding to include physical rehabilitation and non-surgical procedures such as acupuncture and intra-articular joint injections. An added benefit of having your pet’s orthopedic surgery performed here is that we have Canine Rehabilitation Associates, the therapy and rehabilitation facility on site who can start your pet and you on the road to recovery. ← Tick Prevention in Dogs is Tick Protection for You!